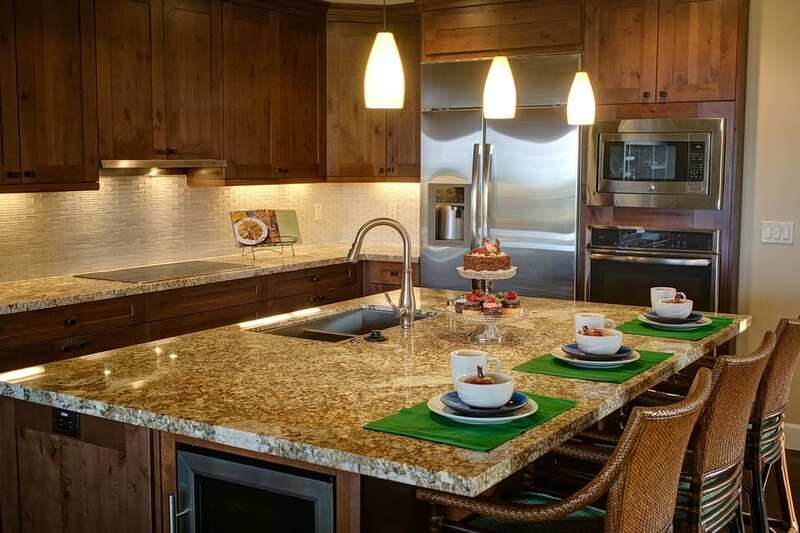 In the modern home, there’s one appliance that’s arguably more important than any other. No, we’re not talking about the television. A fridge affords us a means of keeping food fresh for days – or longer – even in hot weather. But not all fridges are built equally – they come in a wide variety of types and configurations, and so choosing between them can sometimes be difficult. Free-standing fridges consist of a single unit – there’s no freezer taking up space. They can be large (ideal for homeowners wanting to maximise the room in their refrigerator) or very small (perfect for small kitchens or as a second fridge). An under-counter fridge is one that’s designed to fit – you’ve guessed it – under the counter in your kitchen. As such, they tend to be significantly shorter (and shallower) than their free-standing counterparts. On the other hand, they’re great for kitchens where space is at a premium. Integrated fridges are designed to be concealed within your kitchen cabinets. The door of the fridge will be attached to and covered by a front panel which matches the surrounding units. They come in a number of different sizes – including under-the-counter models and tall fridges, like the one pictured below. Integrated fridges tend to be more expensive than freestanding models. This could be down to several factors: integrated fridges must be replaced by a fridge with precisely the same dimensions, which reduces the effective supply and allows manufacturers to raise prices without fear of competition. In addition, fewer homeowners tend to choose integrated fridges, so they must be manufactured on a smaller scale. 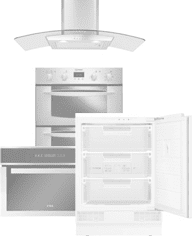 A fridge freezer is an appliance which incorporates a fridge and a freezer into a single unit. 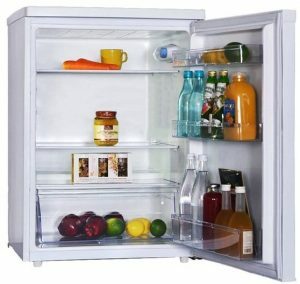 In larger (and more expensive) models, the two compartments are often divided vertically, resulting in a full-size fridge and freezer. For the most part, they’re stacked one atop the other. Fridge freezers can either be free-standing or integrated but under-counter fridges and freezers tend to be separate units. Naturally, the size and shape of a fridge is an important consideration – you’ll want it to fit as snugly as possible into the surrounding space. If you’re considering a free-standing fridge, then you’ll have a bit of leeway to work with; if you’re considering an integrated or under-counter fridge, then you’ll need to take careful measurements to ensure you buy a fridge that will fit. This leads us to a common question: are integrated fridges a standard depth? If you’re buying an under-counter fridge, you should be aware that most work surfaces in the UK are 90cm tall. Going over (or significantly under) this height is likely to result in problems. Standard kitchen cabinets are around 60cm wide and deep, so new fridges should stick within these boundaries. Of course, it might be that the space you have in mind doesn’t quite fit standard dimensions. In that case it’s worth breaking out the tape measure and double checking. Free & fast delivery available on all of our top-quality fridges when you buy online today at Ship It Appliances! Don’t miss out! Let’s talk about a few features you might want to look out for when buying your new fridge. Over the lifespan of a fridge, ice can build up along the interior walls and along the condenser coils at the rear of the fridge. If this ice is allowed to accumulate, it can begin to effect the flow of air around the fridge, thus preventing the fridge from working properly. An auto-defrosting fridge will automatically perform defrosts, saving you the trouble. In order to provide extra protection against harmful bacteria, many fridges come coated with special inorganic compounds designed to prevent harmful microbes from establishing a foothold in your fridge. It’ll also help eliminate nasty smells. Not everyone uses their fridge in the same way and adjustable shelves represent a welcome convenience for most of us. A wine rack is a simple metal frame that hangs within your fridge. It can be easily detached if not required and it’s capable of storing drinks other than wine – so if you think you’re going to be using a lot of space in the door of the fridge, it’s a worthwhile addition. Depending on where you’ve positioned your fridge, you might wish for the door to open in the opposite direction, in which case you would require a fridge with a reversible door.